One of my favourite moments during a wedding, is that moment when parents have the chance to congratulate their children. For me, it’s almost a sacred moment. The reason for this, is that after observing many weddings, a pattern became visible to me. When a couple rushes off straight after the ceremony, into their car to go to another location, I often see parents looking emotional and a bit disappointed. Then, when you have this moment an hour later, the initial raw emotion, has often faded. After noticing this, I feel the need to explain to my couple how precious these moments in time can be. And now they often reserve a special moment right after the ceremony with only their closest loved ones. Afterwards, they always tell me that that part was one of their highlights of the day. I really look forward to this part of the wedding. Especially after an emotional ceremony, I know real and valuable moments will be guaranteed. The fun part for me is that you never know who is going to ‘break’ in a sense, so I always keep my guard on. Being really small and having no second shooter makes me invisible at the scene and that makes it possible to come really close without being noticed. In the beginning I tried all different angles, but now I choose to either stand behind the couple and watch carefully for intense portrait shots, or I stand at the side to shoot with a more journalistic approach, including more layers in the frame. But because I am a portrait lover by heart, I love coming super close so I can feel their energy. The closer I get, the more emotions I feel. What happened during this wedding, is that the bride has a strong connection with her dad. And this particular ceremony was one of my personal favorites, so much laughter and emotions, and a wonderful little girl that behaved absolutely amazing. So, when (grand)dad came to give them a hug right after the ceremony, my eyes caught this moment, my heart skipped a beat and a second later it was gone. 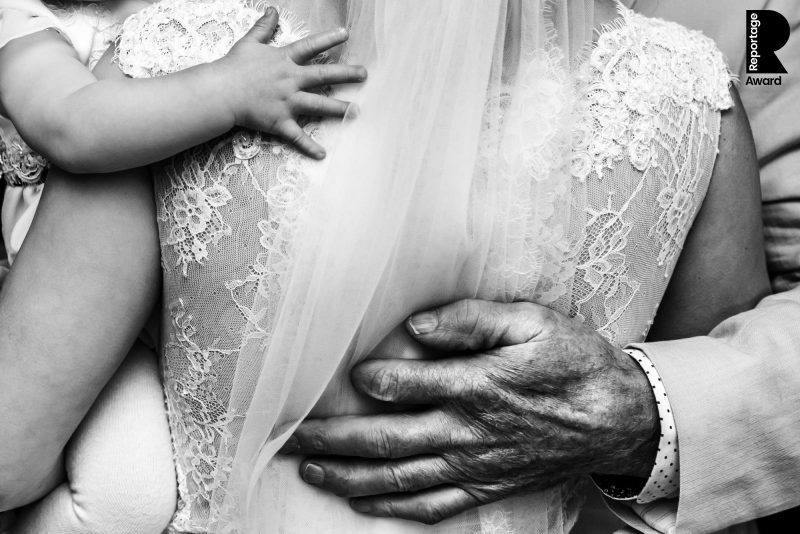 This image is about generations, it’s about family, it’s everything I hope to see, feel and capture on a wedding day. It’s such a small gesture, but hands tell a universal language which we all understand. This image kind of sums up my style and approach to a wedding. I love children, I respect generations, I love details that are unique to a couple. And every time I look at this image, I feel thankful for my job. Oh.. and what I did not know at that time, is that there was another generation hidden in the frame. He will join his family later this year! You can see more of Kim’s great work on her website, or her This is Reportage profile. We also have lots more wedding photography tips by our members; you can view them chronologically, or by type/area. Would you like to join us? We’re all about featuring the documentary-side of your work; showing the world just how important the art of moment-capturing really is. Members receive lots of benefits, including 60 Reportage Award entries and 18 Story Award entries per year; the results of Collection Seven due to be announced in around a week. See all the other benefits of membership and apply over here.